Olympus has released the new CKX53 microscope, including a novel inversion phase contrast (IVC) imaging technique. While a variety of capabilities enable the CKX53 to deliver high quality images over a wide field of view for live cell and fluorescence imaging, the system is also tailored to the cell culture process with optimised ergonomics and fast, intuitive operation. Fast processing is vital to minimise the time precious live cells are removed from optimal incubation conditions, and the new Olympus unique integrated Phase Contrast (iPC) system simplifies and speeds up Phase Contrast observations with the CKX53, removing the need to prepare or centre the objectives when moving between 4X and 40X magnification. Alongside this, phase contrast observations are enhanced with the novel Olympus IVC technique, enabling 3D views devoid of halos or directional shadows. In addition to phase contrast and brightfield observation modes, high contrast fluorescence imaging is also possible for multiple signals, utilising the advanced technology of the successful IX3 inverted microscope series. 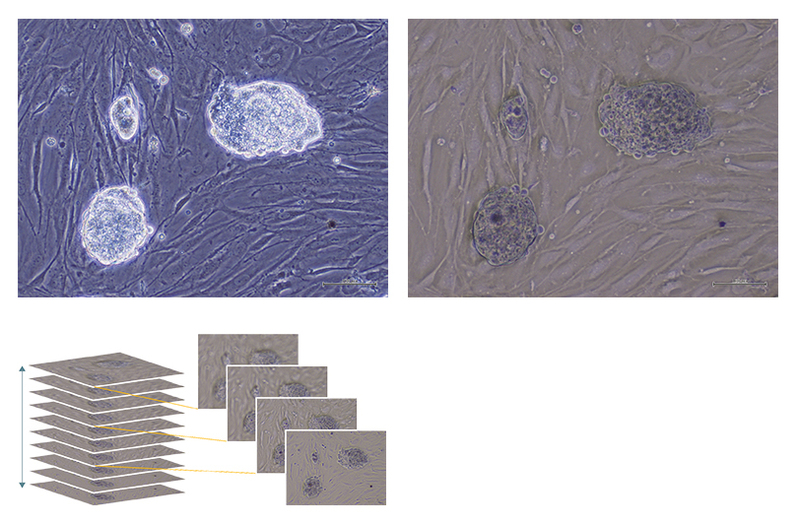 Whichever observation technique is employed, a wide field of view saves further processing time through allowing quick screening of cell culture samples without the need to move the stage, which is ideal for observing large embryonic and induced pluripotent stem cell colonies in a variety of different microtiter plate formats. At the core of the CKX53 are the superior Olympus UIS2 objectives with a large field number of 22, providing the basis for excellent image quality. Using the 2x objective together with a precise aperture stop, observation is possible over areas of up to 11 mm in diameter. Over this wide field of view, significantly higher illumination intensity and uniformity is now also achieved with long-life LED illumination, lasting over 20 hours with a colour temperature of 4000K. In addition to ensuring the highest image quality, operational and ergonomic design has also been optimised for cell culture applications, with different configurations tailored to suit every need. The systems are easy to clean, and the small footprint and UV light resistance means each can remain inside the clean bench environment, with sliding pads to allow easy one-handed repositioning. Multiple holder types are also available to accommodate a range of sample formats, even multi-layer tissue flasks. The CKX53 is the latest addition to the growing Olympus portfolio of cell culture solutions, and complements the newly launched cell counter model R1, which simplifies and shortens the cell counting process to just 15 seconds. These advanced solutions combined with Olympus’ expertise strengthens support to drive cell culture applications, ranging from regenerative medicine to drug development.